Note: This does contain spoilers for the old Living Forgotten Realms battle Interactive The Paladin’s Plague, ADCP2-1. When Sean Molley was working on the excellent ADCP2-1, The Paladins’ Plague, John DuBois contributed by assisting with an idea Sean had regarding a change deck that could cover how the environment interacted with the PCs. In addition, he created a Word document that contained the effects. Despite the D&DXP convention (now called Winter Fantasy) being just two days away, I couldn’t help but realize that John had given me everything I needed to put the effects into MSE format. I spent a couple of hours pulling the text in and adding some quotes and titles. I used Daniel Rivera’s excellent Sorcerer template for a great look and format. You can see an example below. I then turned the cards into PDF format with doPDF, a program that prints to pdf format. The result is a full-color awesome-looking change deck that DMs can use. Just print, cut, and shuffle. Use them at the table as the adventure plays out in the manner indicated by the adventure. You can place them in card sleeves. There are card backings available in some of the sites below, or you can just use the sleeves themselves or old CCG cards. I have long used MSE (Magic Set Editor) and various user-created templates for power cards. 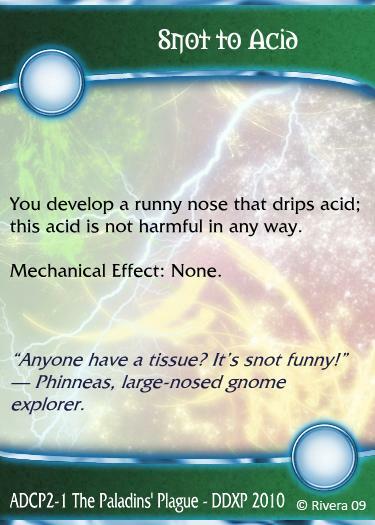 MSE allows you to have really cool looking power cards with custom text reflecting exactly how the power works for you. You can make changes that would not be possible with Character Builder, plus use a format that helps you find the information quickly in a game. You can download the program from the above link, then check out some of the templates and learn how to use them with this EN World thread (they used to have a wiki but took it down… now you have to wade through the thread). There are a lot of great templates and a lot of smart people have made contributions. My favorite template comes from Daniel Rivera. 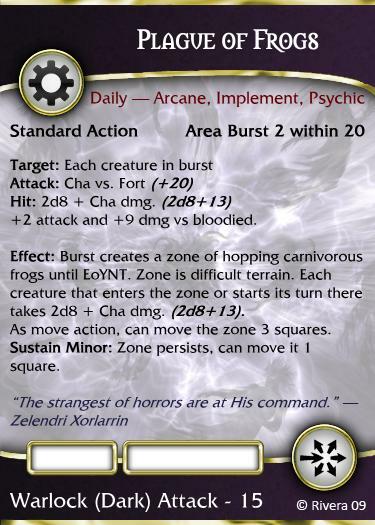 His 4E and 5E templates are for sale, and you can then find PC card text elsewhere so you don’t have to type everything. You can see one for my Darklock below. This entry was posted on October 2, 2015 by Alphastream and tagged 4E, Character Building, Conventions, Forgotten Realms, Props.